It's a hell of a thing, having a sister. First you fight like cats and dogs, and if you're not getting in trouble for knocking her teeth out, you're yelling at her for eating all of the (insert literally anything here) even when you'd told her not to. And you just know she'll be your annoying, exasperating nemesis forever. Then she turns fifteen and she's dating boys and gone ALL the time, and one time you stay up literally all night long to keep her from sneaking out of the house, and she's wicked pissed at you. And you just know that as soon as she's out of high school, she'll be gone for good and you won't be a family anymore. Then at twenty-three, she decides she's going to be a vet. She gets a degree in biology. She takes all of the classes, gets all of the grades, applies to all of the vet schools – and keeps getting rejected. For four years. Then she gives up on the dream. She says she's not going to be a vet, and you wonder what she could possibly do instead, because you've never tried and failed that hard at anything in your life. And you just know she's never going to make it. 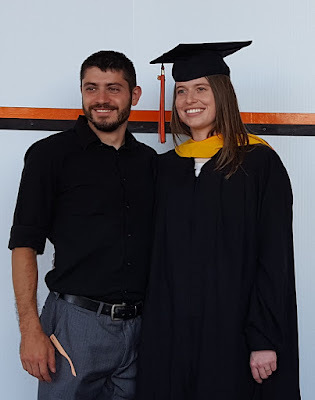 Then – by which I mean now, yesterday, this weekend – her charming ubermensch of a husband drives your whole family up to Oklahoma to watch her walk across the stage and receive her Masters in International Agriculture, which is officially becoming a PhD in Veterinary Biomedical Science. She's not going to spend her life neutering cats and dogs. She's going to cure equine diabetes. She's going to replenish the oceans with tuna. She's going to save the goddamn world. And this is why I don't believe in happily ever after – because it implies there's no more story left to tell. It erases all of the messy middles, the hard, unrewarded work, the life-changing chokepoints that force you to revise yourself and move forward. Give me long enough and I'll find a new thing to worry about, a new reason why everything is hopeless. But I won't wish for a straight, easy road. When you're related to Allison, there's no such thing as happily ever after. There is only boldly forward – usually in a cloud of dog hair and fruity shampoo. And I just know it's going to be a hell of a ride.